Most of the web2.0 design allows the user to change the font size of the main content area. This is indeed a good usability. So I thought, I should contribute something here. 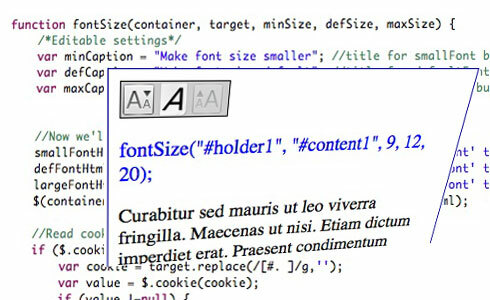 The result is a small jQuery code which can be used to generate a font size changer interface. // content is the id of the element where the font size changes will take place. After the function is called, the controllers will be generated in the specified area like the following. We need some buttons for the backgrounds and the best places to search is Icon look, Icon Finder and Icon Let as usual. I found the above images, but you can use another or design yours. Now we need to style the elements. Mainly we need 5 styles – Button for smaller font, default font and larger font. We need two more styles for the disabled state of buttons. (If current font size is the minimum or maximum allowed, we need to show a disabled state). As you can see I’ve used three background images for the three buttons. Need to set the display:block property as the buttons are of 32px height. I could have optimized the css more by applying common styles to elements. For eg: For the three styles only background is different, so it could’ve declared like the following. Now for the disabled state I used same style for all buttons. Using opacity filter is the easiest way to imitate a disabled button. Here for IE8, I have used an extra style after googling around. I didn’t write it as a jQuery plugin because I didn’t find it useful to have the chainable functionality. Include the css file, then after including jQuery include this script like the following (Don’t forget to change the path as required. Also, you need to copy the images in correct folder as specified in CSS file or edit the CSS file to make it correct. Then inside your html create the empty container for holding the elements. Give it an ID or class, if possible ID. This entry was posted in jQuery, Tutorials and tagged change font size, font, font size controller by admin. Bookmark the permalink. ← Previous Previous post: Color picker galore! Next → Next post: How to make your forms better with jQuery?